North Shore Animal League America is the world's largest no-kill rescue and adoption organization, so finding the perfect match for our shelter pets is our specialty. Whether it's an adorable puppy or kitten who is adopted in the blink of an eye, or an older animal who has to wait for that special someone to give them a second chance, Animal League America will do whatever it takes to ensure our animals find a better life. One of our shelter pets who hasn't had the best of luck when it comes to finding a loving home is Gloria. 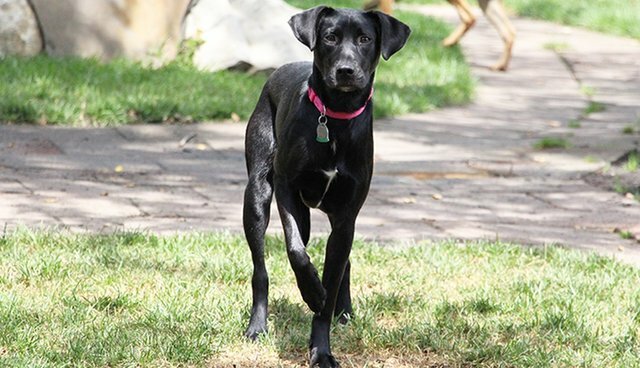 This 7-month-old black lab mix is a southern belle rescued from South Carolina. She's super sweet, but a bit shy and can be fearful in unfamiliar situations, so she would prefer a quiet home with other dogs who can help build her confidence. Despite her cautious demeanor, we here at Animal League America believe that, if given a chance, she can really shine. "I have a real soft spot in my heart for Gloria. Before she went into a foster home, she stayed in my office with me during the day because she thrives when she is comfortable and feels secure," said Manager of Rescue Services Cindy Szczudlo. "She may be shy, but once she warms up she is the sweetest dog. In the right setting I know she can be an amazing pet, so I'm hopeful we can find that for her." Our pet behavior trainers recommend that the young pup is adopted by a person or family with previous dog experience and a secure yard where she can let out her energy. Canines are creatures of habit so adjusting to life in a new home can be a challenge for any dog, especially one with as cautious as Gloria. Anyone who decides to make this gorgeous girl part of their family should understand that she would require a lot of patience and understanding, but also the freedom to slowly come out of her shell. We are confident that Gloria's perfect fit is out there, and we're just waiting to facilitate the love connection! If you're interested in learning more about Gloria or coming down to our Port Washington, NY campus to meet her, please contact Manager of Rescue Services Cindy Szczudlo at 516-883-7900 ext. 272 or cindys@animalleague.org.